In the main Justice League comic, some of DC’s preeminent superheroes have become infused with the power of gods. All that increased might hasn’t exactly changed Superman, Batman and the Flash for the better. The Dark Knight’s campaign for justice was already obsessive but, when he becomes the God of Knowledge, it gets extremely personal. In the current Justice League storyline, the super-team’s caught up in a cosmic battle between two of the multiverse’s most powerful villains, Darkseid and the Anti-Monitor. The climactic clash between the two left Darkseid dead and various members of the League radically transformed. The Flash has been bonded to the Black Racer to become the new God of Death. Superman’s absorbed negative energy from Darkseid’s home planet of Apokalips and changed into the God of Strength. And Batman now sits in the Mobius Chair once occupied by the all-knowing Metron, which has transformed him into the God of Knowledge. The Darkseid War happens before the big changes that have shaken up some of DC’s biggest icons. Wonder Woman’s costume change and political dramas aren’t seen here. And the story arc stars a Superman who still has his full power set and secret identity. Batman is still a Bruce Wayne who has full memory of the training and trauma that helped him become the Dark Knight. The source of that trauma is the main focus of a new Batman one-shot tying into The Darkseid War. Written by Peter Tomasi, with art by Fernando Pasarin, Matt Ryan, Gabe Eltaeb and Dave Sharpe, Justice League: Darkseid War: Batman #1 shows what happens when an omniscient Batman comes home to Gotham. His newfound power lets Batman read minds, predict the future and teleport, which he uses to stop crimes before they happen. Of course, this kind of crimefighting doesn’t hold up in court and that makes Commissioner Gordon pretty mad. 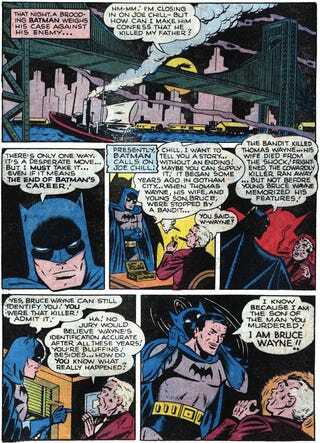 After going all pre-cog on some other would-be lawbreakers, Batman turns his attention to the most important criminal in his life: the man who killed Bruce Wayne’s parents. When all the knowledge of the universe flooded into his head in Justice League #42, Batman learned the name of the petty crook who murdered Thomas and Martha Wayne. As written, the scene is unclear as to whether Batman knew who Joe Chill was prior to this moment. DC re-booted its continuity in 2011—making much of its publishing history irrelevant and resetting the fictional lives of its characters—which means that this could very well be the first time the revelation happens in this Batman’s life. Update: It’s been pointed out that Bruce Wayne learned who killed his parents after the the New 52 reboot in Batman: The Dark Knight #0. The confrontation between Joe Chill and Batman has happened before. The first time was in 1948’s Batman #47, where the superhero tracks down an older Joe Chill who’s risen through Gotham’s underworld. That beat would get repeated and expanded upon as the decades rolled on, as seen in the 1970s re-telling excerpted below. As various creators revisited Joe Chill and what it would mean for Batman to come face-to-face with him, the element of retribution at the hands of other criminals became part of Bat-lore. You can see a version of that idea play out in a clip from the Batman: The Brave and the Bold cartoon below. Tomasi’s scripting of that scene hits many of the same beats but adds a few important changes. This sequence finds Chill doing hard time in a jail cell, not an underboss in Gotham’s mafia. And the writing makes Chill out to be more of a sadist, gleeful that he killed rich people and held the power of life and death over a scared eight-year-old boy on that fateful night. Then, as has happened many times before, Batman drops the bomb. It’s still a powerful moment. Traditionally, this scene has been when Batman’s shown himself to be the most human, most vulnerable facet of the Dark Knight myth. He goes from an implacable force of nature to a rage-filled grieving boy, one who, in some iterations of the scene, stands on the cusp of taking Chill’s life. It can be argued that making Batman a literal god makes him even more fearsome and that his unmasking is a sign that he hasn’t lost touch with his humanity. But, mostly, it feels like this piece of Batman lore is happening in the wrong place. The Dark Knight doesn’t earn this knowledge the way he did in other versions of this confrontation. None of that sowing fear and reaping justice by virtue of skill and training. A magic chair tells him. Batman unmasking himself to the person who killed his mom and dad loses some of its dramatic impact when it’s wrapped up in a tie-in to a cosmic-level Justice League storyline. Sadly, it’s yet another tidy metaphor as to what happens when these characters’ long publishing histories get scuttled by editorial fiat.